From left: Wafaa El-Sadr, MD, MPH; Susan Eshleman, MD, PhD; Estelle Piwowar-Manning, MT(ASCP); and Myron (Mike) Cohen, MD. Estelle has served as the deputy director of the HIV Prevention Trials Network Laboratory Center for over 20 years, and also serves as the director of the QA Core. As a medical technologist with an extensive background in global health and laboratory testing, Estelle has worked tirelessly to provide global laboratory quality and ensure the proper execution of laboratory analyses within HIV clinical trials. She oversees laboratory components and support for fifteen active protocols, all of which focus on biomedical interventions or integrated strategies to prevent HIV acquisition in a number of at-risk populations, including youth, women, and transgender individuals. 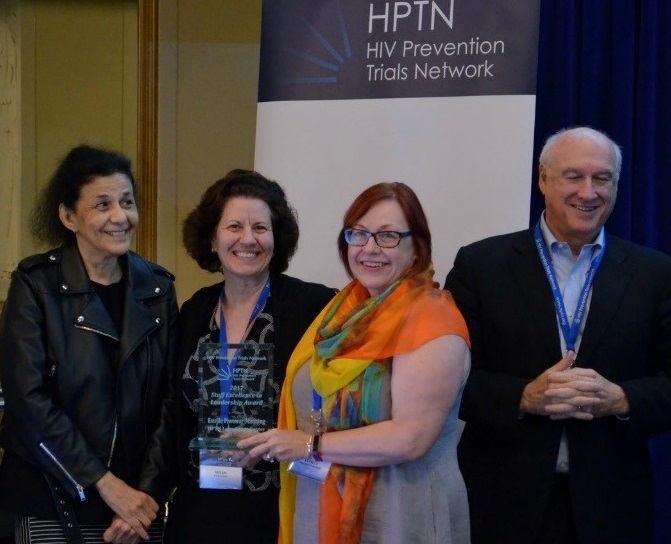 This achievement highlights her immense dedication and support of clinical trials research in the area of HIV prevention. The award presentation, which was held on May 18, 2018, was met with applause and cheers from Estelle’s many colleagues, who include members of the global laboratory community, with whom she has worked with for many years.